This property is 12 minutes walk from the beach. With an elegant restaurant, The Golden Lion Inn offers boutique bedrooms with free Wi-Fi and Welsh mineral water. The hotel is in Newport, in the heart of the Pembrokeshire Coast National Park. Just a 15-minute drive from Fishguard Ferry Terminal, the family-run Golden Lion Inn is 3.2 km from Newport Beach. There is free on-site parking, and Cardigan is a 15-minute drive away. Nightly rates from $104 to $170. Room facilities: Tea/Coffee Maker, Telephone, Hairdryer, Desk, Free toiletries, Toilet, Private bathroom, Heating, Bath or Shower, Interconnected room(s) available, Flat-screen TV, Wake-up service Can you tell us what you'd like to see here? Room facilities: Telephone, Hairdryer, Desk, Free toiletries, Toilet, Private bathroom, Heating, Bath or Shower, Flat-screen TV, Wake-up service Can you tell us what you'd like to see here? Room facilities: Telephone, Hairdryer, Desk, Free toiletries, Toilet, Private bathroom, Heating, Bath or Shower, Flat-screen TV, Wake-up service, Towels Can you tell us what you'd like to see here? Room facilities: Tea/Coffee Maker, Telephone, Hairdryer, Desk, Free toiletries, Toilet, Private bathroom, Heating, Bath or Shower, Flat-screen TV, Wake-up service Can you tell us what you'd like to see here? Busy pub serving good food. We had Sunday roast beef with the veggies and it was very good. Service was good even with big holiday weekend crowd. The Place to Eat in Newport We were a large mixed age group and all had an amazing meal. Fish was absolutely perfectly white and flaky with light crispy batter, steak perfectly cooked, burgers delicious. Very clean plates at end of meal and all the team were extremely helpful, courteous and looked after us SO well. I've been coming to the Golden Lion for 15 years since my folks moved to the area. I've eaten and drunk many times. Service, food and beer is superb. I've stayed in the rooms and had many great evenings here. It really is a great pub. Just go. Great pub lunch. Good portion sizes. Dog friendly. Brilliant service. Would have given 5 but as everywhere in West Wales the kitchen closes after lunch and between dinner. If your in Newport it is a deffo place to visit. Mostly excellent food, service was fantastic, the beef lasagne had been microwaved a little too long and as a result was hard all around the edge. My wife did also find a long hair in the starter which was a little off putting! We have always thoroughly enjoyed our visits but this time not as much hence only the 4 stars. Known this pub for over 40 years, it's brilliant. The food & service is second to none. Always guaranteed a fantastic meal/evening. Food very good. Would strongly suggest some training in customer relations be given to female staff however. Really a shame as their surly manner spoils the evening. A welcome sanctuary after failing to find a pub either open or inviting in Fishguard. Friendly staff and lovely food. Thank you to the guy in the Co-op for the advice! Just had the most amazing steak and my partner had salmon which was equally delicious. If you are in Newport come im for lunch or dinner you will not be disapointed! Another gem. Very friendly and helpful stall. Delicious Food. So good we. Came back for a second night whilst on holiday. Lots of veggie options. Highly recommend the Broad Bean and Spinach Burger. If I could give ten stars I would. Stayed here for one night; was impressed overall. Warm welcome, a nice room with tea/coffee making facilities (And Biscuits! ) And a yummy breakfast in the morning to finish off a quality stay. Haven't stayed here, but have had a few meals, all excellent. Edit: Another great meal in the bar last night. Plenty of interesting veggie options and my carnivore daughter said her burger was the best she'd ever had. Excellent deserts too. The owners of this establishment should be extremely proud of what they have achieved. We checked in on the 20th Jan 2018. The staff member who checked us in was very thorough, very chatty and a pleasure to talk to. She showed us to our room giving good info about the hotel. Room was excellent and had a rear car park which was excellent. We ate in the bar as the restaurant was fully booked, however the staff were just as efficient. Took our food order at 18. 30 when the kitchen opened and we were eating by 18. 50. The only thing I can say about the food was absolutely excellent. Bar was busy all night, but I didn't have to wait more than 2 minutes to get served. Band playing from 21. 30 and nice blues cover band. Breakfast this morning, for a while we had the restaurant to ourselves. Again service was second to none. On offer was a range of cereal, fruit juice and fruit. We both went for the full English which again was really tasty. Checked out by 11am, and will certainly return again later this year. I advise all those who read these reviews to get booking as you will have an excellent nights sleep, good food and good service. Well done all the staff and management at the Golden Lion. Very high class pub. Quite expensive but amazing food! Sunday roast was awesome! Delicious meals, winter has mulled wine, super good to drink! The restaurant has a great atmosphere. The food was really good. Whilst the portion sizes looked small there was plenty of food for everyone. The staff were friendly and were served in a timely fashion even on a busy Friday evening. Would definitely recommend and go back myself when in the area. Lovely atmosphere, friendly staff and good food. The broad bean burger is one of the nicest veggie burgers Ive ever tried. Friendly service and great food make this one of the best places to eat in Newport and the area. There is a small carpark on the opposite side of the road and tables in the terrace garden, restaurant and bar. It is a must place to go for me whenever I visit Pembrokeshire. Thoroughly recommended. Friendly, attentive staff. Great food at a good price. Amazing. Great selection of local ales and great food. Does tend to get very busy, so booking maybe wise. Dog friendly everywhere but the restaurant. Great pub, but very popular! Perhaps larger portions would be provided for the price of food for those active in the fresh air all day. Plenty of character and pleasant staff. Excellent food. Portions may look small but is enough to fill. Went for crab and lobster cocktail starter and lamb chops for main. Garlic potatoes as a side were divine. My friend has the fries. That was a pretty bad choice. Dry and too crunchy. Venue is dog — friendly and there's different seating available — bar, restaurant, marquee or garden. First visit here and it definitely wont be the last. Beautiful food. Calming atmosphere, although a lot of children screaming at one point. And very friendly staff. I had the best apple crumble in the world! Took me forever to eat because I didn't want it to end. Delightful. Busy pub on the high street in Newport. Has a bar area and restaurant. The bar serves real ales and we managed to get a seat in the restaurant for diner without a reservation. Food was tasty with lots of specials to choose from and a good pub menu with plenty of fish and vegetarian options. Great food. Lovely selection of specials. Cosy atmosphere. Friendly staff. What more do you need!? 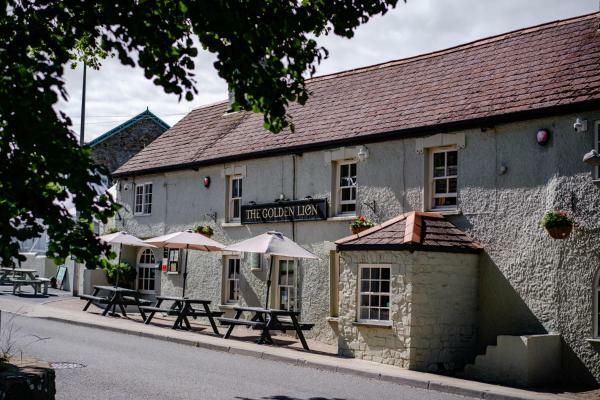 The Golden Lion had nice, modern rooms and a traditional bar and dining area. Breakfast was excellent. The staff were very helpful and friendly and overall our stay was very enjoyable. Fantastic food and lovey staff. Contact less payment! Great food. Great & friendly staff. An amazingly friendly pub restaurant — superb lunchtime menu, verging on/achieving fine dining standards. Excellent service and bags of atmosphere — highly recommended. Food was almost as tasty as the staff, Martina, call me. We took two wet dogs here after a run on the beach, but we still got a great welcome and a lovely meal. We will definitely be coming back. Nice friendly pub atmosphere. Lovely food. Good selection of drinks. Happy times. The food is excellent, the beer is good and the staff? Just wonderfully delightful. A quaint little pub with excellent character and friendly staff. Oh good beer too. A friendly pub with a nice, cosy atmosphere. Fish specials were excellent and delivered quickly from the kitchen but the staff seemed to struggle with bar service. Felt like a good place to get lunch after walking near the estuary. In all the years we've been coming to the Golden Lion we have always had excellent food and service and company! Thoroughly recommend it. All children under 16 years are charged £ 25 per night for extra beds. All further older children or adults are charged £ 25 per night for extra beds.